Monday night was the first Langley City council meeting of 2018. The first and second reading of the City’s 2018 Financial Plan was the primary item on the agenda. Today’s post will highlight some of the operating portions of the budget, and tomorrow’s post will focus on the capital works portion of the budget. The 2018 Financial Plan is focused on four main areas: improving public safety, addressing homelessness, enhancing the parks and recreation system, and renewing infrastructure. The operating budget is proposed to increase by $1.27 million in 2018. Around half of this increase is driven by critical public safety services, and to address homelessness in our community. RCMP policing costs are budgeted to increase by $539,250. Fire Services wages and benefits are budgeted to increase by $279,065. The City’s Bylaw enforcement department also grew by one person this year which required a $38,630 increase in the proposed 2018 budget. Security costs at Timms Community Centre is also proposed to increase by $32,245 to ensure that it remains a safe space. To address on-going cleanup costs relating to homeless camps in our community, the budget for camp cleanup costs is proposed to increase by $30,000. The new Timms Community Centre is well used. With increased programming, the budget for recreation services is proposed to increase by $84,990. The new Penzer Action Park has also been well received in the community. The budget to maintain that park is proposed to increase by $28,320. A new Facilities Maintenance Worker position is being proposed to ensure that City facilities remain in a good state of repair. Wages and benefits for municipal employees is budgeted to increase by $356,135, and council remuneration is budgeted to increase by $105,605. Employee wage and benefit increases are driven primarily by collective agreements, and contract requirements. 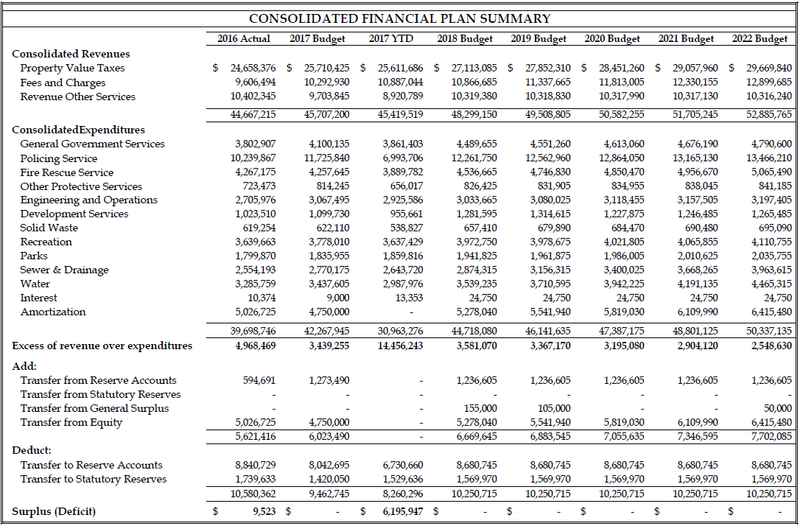 The following table provides an overview of the 2018 Financial Plan. A full list of larger changes in the proposed budget can be found on page 5 of the 2018 Financial Plan. 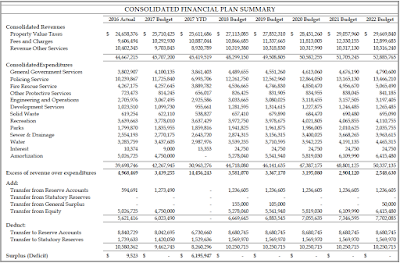 Langley City 2018 Consolidation Financial Plan Summary. Select table to enlarge. At the end of the day, the proposed budget will require a 4.94% residential property tax increase. As I posted about earlier this month, this increase will not be distributed evenly due to how the BC property tax system works. Some people may see a property tax decrease while others may see a larger increase. The following table shows the changes in property tax of an average multifamily home over the last five years. The proposed operating portion of the 2018 budget will help support to improve the quality of life for people who call Langley City home. You can provide feedback on the proposed budget by visiting the City’s website. There will also be an open house at City Hall on January 31.